Kiwano melons are available year-round. Kiwano melons are a good source of Vitamin C, iron and potassium. It also contains smaller amounts of phosphorus, magnesium, zinc, calcium and copper. 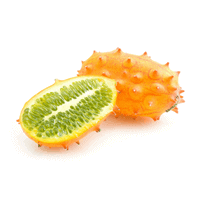 Choose kiwano melons that are bright orange in color and free from bruising or soft spots. Store kiwano melons at room temperature. Don’t refrigerate! Once ripe, kiwano melons are best consumed within a few days. Trim off kiwano melon spikes with a veggie peeler, then slice into rounds or wedges. The peel, pulp and seeds are all edible. Try sprinkling with salt or lemon juice for a yummy snack. Or, use a spoon to scoop out the pulp and add to smoothies or salad dressings. Kiwano melons are also known as a horned melon or horned cucumber. The pulp is lime green and similar to jelly, and filled with tender, white, edible seeds. It tastes similar to a cucumber, melon or lime. Did you know Kiwano melons made an appearance in “Star Wars: The Force Awakens”? A bowl of horned melons were spotted in the movie when Rey sat down to eat at Maz Kanata’s castle.